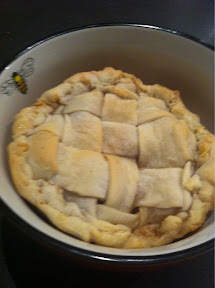 I love apple pie…. Really. To the point that large ones get eaten too fast to be healthy. This weekend I had leftover puff pastry, and I hate wasting pastry. Nom nom nom pastry. Simply roll and line a greased pie tin. Peel and slice 2 apples. I used Braeburn because I had them. Sprinkle with cinnamon and throw in 2 cloves. Cut pastry strips and form a lattice top. Roll the edges and bake for approx 15 minutes at 180 degrees C.
Wait a little. Or it will burn your entire face. Eat while warm…. I ate mine fore eating dinner…. Then I skipped dinner. I think a simple peeled sliced apple works well, as the pie doesn’t get too damp, yet has a good moist quality, without running the pastry. The pie doesn’t need sugar in my opinion. Amazing with custard or cream. Or both.